Concrete is pretty amazing stuff. It can be poured, shaped and made into just about anything you like. But even though it’s incredibly strong, it’s not indestructible. So, when you see cracked concrete or a driveway or patio that has sunken or broken slabs or is pitted, flaked and stained, there are reasons why these things happen. When your home was built, the contractor likely moved the soil around the building site resulting in poorly compacted soil. And even when it is compacted well, it’s never as stable as the original soil. Over time, this can cause voids to form and slabs to settle. Another cause of soil failure is drought. During dry conditions or even just during periods of warm weather and low precipitation, the soil under your concrete will dry out and shrink, creating voids. The concrete above eventually cracks and sinks into these empty spaces; especially if any weight is placed on it. When the rains return, the water has an even easier pathway under the slab due to cracks and crevices left over from the dry period. And this wet, soft soil is just too weak to support the concrete above it. In the worst case, the soil erodes and washes away completely, leaving behind large voids that cannot support the weight of the concrete above. Moisture is concrete’s strongest enemy. It seeps into the pores of untreated concrete, and when temperatures drop, especially during freeze-thaw cycles, that trapped moisture expands as it turns to ice. This expansion destroys the pores and weakens the concrete. This results in concrete slabs that can pit and flake. Concrete’s porous nature also makes it susceptible to staining when left untreated. As a homeowner, you don’t just have to worry about your own concrete slabs; you should be concerned with the slabs that make up the street that goes past your house. 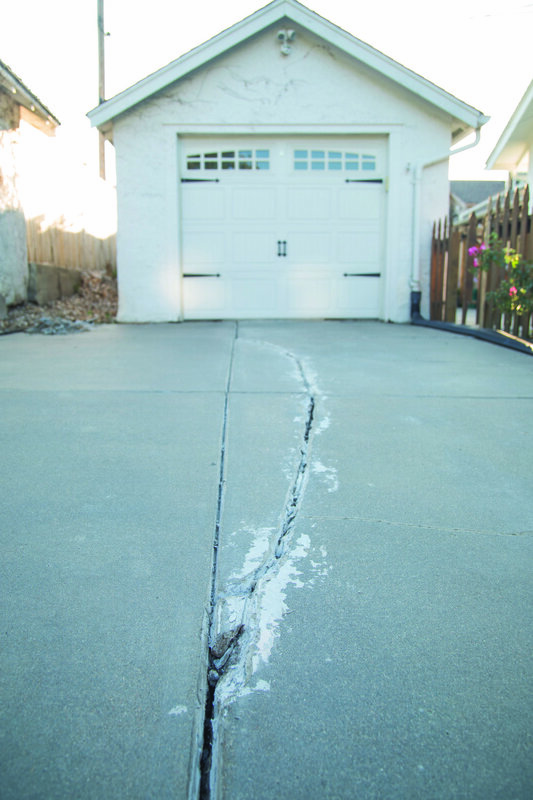 During colder months, your street’s slabs contract, opening up the joints between them. Those joints then become filled with pebbles and other debris. Then, when the warm weather returns, the slabs expand again — only the joints that were designed to absorb this expansion are now filled with material that won’t compress. This leaves the expansion pressure nowhere to go except up your driveway. This “street creep,” as it is known, exerts incredible pressure on your home and can cause all sorts of problems. Cracked and sunken concrete isn’t the end of the world, however. With the right technology and the right know-how, it can be lifted and leveled , so that it can be enjoyed as it was meant to be.